The first race of the season is always an important one – a crucial gauge of training and form, and a guide for what needs to be done ahead of the season’s bigger goals and milestones. For Team Spur’s Swiss machine, Ariane Lüthi the first race of the year hasÂ traditionally been the gruelling 121km Fairview Attakwas Extreme MTB Challenge, from Oudtshoorn to Great Brak. 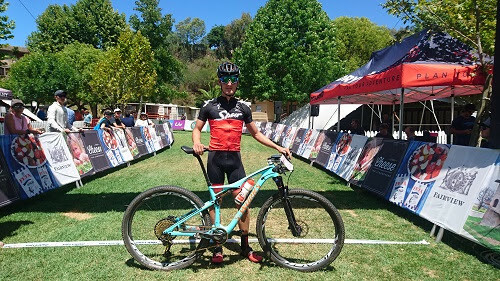 This year the team’s new recruit Alan Hatherly also made his debut at the event, taking on the Spur Atta Mini over 52km. After a tough day out, Ariane soldiered to a very credible fourth place among a stellar UCI women’s field, while Alan took the win over the shorter route. Here’s how it all went down. While Alan will focus on the XCO discipline in 2017 he will race a selection of longer events, including the Ashburton National MTB Series opener in Grabouw on Saturday, 28 January where he will contest the 72km distance. “I opted for the Mini because it’s obviously a shorter, more explosive race and will help me prepare for [the Ashburton event] next weekend,” he said. As a five-time winner at what is considered one of the toughest one-day races in South Africa, Ariane was eager to reclaim her title. The 2017 edition was a UCI-rated World Marathon Series event and Ariane found herself up against the strongest field ever assembled in the 121km point-to-point race. Also, having missed two weeks of crucial training in the build up due to injury she wasn’t on the start line with the same amount of hours in the legs as in the past. After a bit of a setback a-third-of-the-way through, Ariane found her legs in the last 40km and grafted her way to a respectable fourth place behind her 2016 Absa Cape Epic partner and reigning XCO World Champion, Annika Langvad, South African XCM Champion and 2016 winner, Robyn de Groot and Swedish XCM Champion, Jennie Stenerhag. “It was great to have our own start batch for the first time in many years,” Ariane said afterwards. While the UCI Men started a minute ahead of the UCI Women, the A-batch men started only three minutes back, which meant the strongest amateur men caught the women at about the 30km mark. Ariane believes the decision to focus on her own race was probably her saving grace: “I think if I had tried to stick to Annika for much longer you probably would’ve seen a big mushroom cloud above the Attakwas,” she joked. On one of the steep, rocky climbs (for which this race is famous) deep in the Attakwaskloof, Amy Beth McDougall caught and passed Ariane. This provided the proverbial ‘carrot’ for her to chase.